I began working with Sitecore in the 6.x days, and one of the more compelling feature sets has been the ability to personalize content. The personalization, testing, and rules-engine features were one of the key reasons our company at the time chose Sitecore for our new patient-education portal: the ability to target content in structured areas of the page based on a visitor's behavior was a key differentiator for our team when evaluating technologies. There's now more ways to augment experience data with data from other systems through xConnect, and in turn, customize the experience for Sitecore visitors. One thing that hadn't changed in that time was the ability to create and execute rules and basic, in-session personalization. While xDB gave us many new ways to personalize based on past visits, long-term behavoir, or data from disparate systems, any Sitecore implementation could take advantage of those in-session rules to change content based on information from the current visit. This background is important, because the functionality changes with Sitecore 9.1. When deploying XM in 9.1, you no longer have access to personalization, testing, or many features utilizing rules -- regardless of your license or use case. If you are upgrading a solution that uses rules or personalization without DMS/xDB, you must deploy the XP product and disable the XP features after the fact. The Sitecore 9.1 XM distribution (What XM stands for in this release is unclear, as the prior name has been co-opted for something else -- see below) is a new deployment package that removes all personalization, analytics, and xDB features from the product distribution. The assemblies, configurations, database items, and more that support those features are gone. In exchange, the 9.1 XM release spins up faster, deploys faster, and runs leaner than its XP sibling. This release is functionaly different than any previous version of Sitecore XM -- which was historically the same Sitecore as XP, just configured out of the box to not provision or use any xDB functionality. Sitecore XM 9.1 cannot run rules, in-session personalization, or content testing. It is missing the code to be able to perform these features. 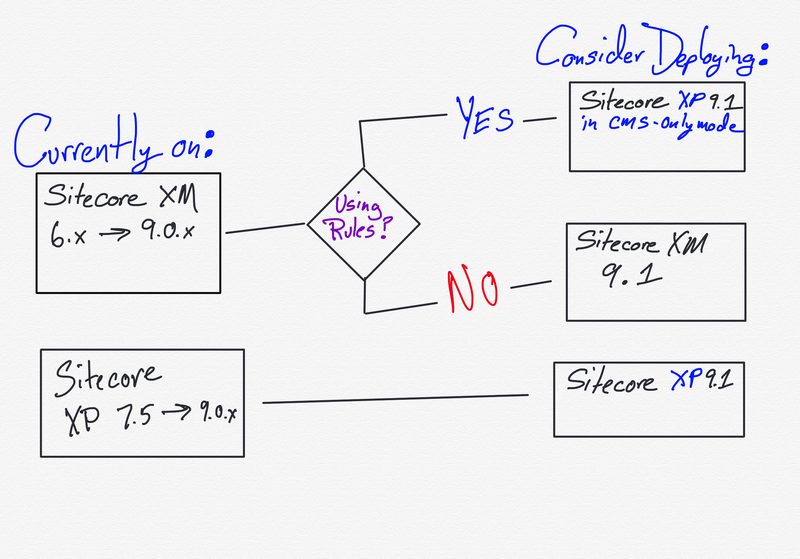 It is best to think of Sitecore XM 9.1 as a whole new product, not a direct upgrade from XM prior. Experience Platform, also known as XP, as of 9.1, is the full distribution package of Sitecore with all assemblies, configurations, and more present. When deploying XP, it also deploys all xConnect roles and databases. From a feature-completeness standpoint, XP 9.1 has all the capabilities present in prior XM and XP releases. Additionaly, the XP release can be configured in a CMS-Only mode (also confusingly named Experience Management) that allows for use of rules in determining presentation, in-session personalization, and basic content testing without xDB. Left: Device Editor viewing renderings on the Sample Page template in XM. Right: The same in XP running in CMS-Only mode. Sitecore XM Prior to 9.1: Content management, with in-session personalization, all out-of-the-box rules, and basic campaigns. No historical personalization (no xDB), and no analytics features. Sitecore XM 9.1: Content management only: no personalization, rules, campaigns, xDB, or analytics features. Sitecore XP 9.1: Sitecore with all features available to be used, including all analytics features, xConnect, and xDB. Sitecore XP 9.1 configured in CMS-Only mode: (AKA -- Experience Management Mode). Similar to Sitecore XM prior to 9.1. Still deploys all XP resources and roles, but can be configured to not use them. Where do we go... Where do we go now? In short, if you're a new Sitecore customer, and you've purchased an XM license and will not be using any rules or personalization in your implementation, you should deploy the XM WDP's either on-prem, in Azure via ARM templates, or the Marketplace XM Deployment. You'll get the same Sitecore content management experience, with all of the performance improvements in the XM release for 9.1. That's a very qualified recommendation, however. If you're going to want to use those features, it's probably best to deploy the XP WDP's instead, and configure it to disable XP functionality and perform in CMS-Only mode. While it will be a hassle to reconfigure your instances and delete the XP resources if you're not planning on using them, it will give you more leeway in functionality going forward. Otherwise, if you're going to want to use those features in the future, you're looking at a redeploy of XP and configuring down. In my next post, I'll be talking about alternative strategies for deploying XP without all of the additional resources in Azure.